A couple of articles that appeared a few days ago in The Washington Post led to some conclusions [see bold type below] that Australia needs to note urgently , despite its slow [up until now] grasp of what school classroom learning is. Blessings of Christmas. Stay alert. Although some ‘pro-Julia education’ ethics-free associations support it, ideologically, NAPLAN is immoral, unprofessional, politically driven, unrequested by the profession, curriculum destructive, extremely costly, wasteful and divisive. Brendan thought that the idea of national testing would appeal to the top end of town and promised school ‘reform’. Kevin liked the idea and threatened the electorate with it as soon as he made the big-time, telling them to “…walk with their feet” if they didn’t like their school. http://greenleft.org.au/node/40238 The totalitarian mode of delivery also appealed to his soul-mate, Julia the Minister and, in a ‘ruddy blush’ so to speak, happily met a sweet talking American lawyer who used fascist-like fear tactics for a New York school district [since failed] using high stakes threats ; so she copied his ideas holus-bolus. Peter follows dutifully and likes the job. These icons [not sure of Christopher Pyne – will he scrap NAPLAN? is he alert to its evil?] whom pro-naplanners follow without question or suggestion, believe that children learn best when they are afraid. Almost every school in Australia obeys these heroes. Yet – believe it –these political leaders, with scant classroom knowledge, prefer to allocate negative critical judgement to as many school tasks as possible, especially public schools. They like school buildings, but don’t seem to like children. Bereft of any ethical child-care idealism, they force schools to be run by symbols and numbers. They have enormous power. Their followers, dispossessed of a professional conscience, are unwilling to provide any counter-weight for NAPLAN’s political-measurement excesses. Why? It seems, as Orwell says, “By lack of understanding they remain sane. They simply swallow everything and what they swallow does them no harm, because it leaves no residual behind, just as a grain of corn will pass through the body of a bird.” They are frightened witless. All pro-naplanners and their heroes must, together, be looking forward to the near-future technology-packed classrooms, where love, personal engagement and encouragement, shared evaluation and pride in each achievement won’t exist; or will be minimalised. The stage is being set. It will be a relief for pro-naplanners. They wont have to think much about teaching and learning. There are thousands of these true-blue educators – expert, child-centred, spunky commentators. Of course, they include every classroom teacher who tries to help children, with love and care, to learn how-to-learn despite the harassment + Allan Alach, Robin Alexander, G.W.Bassett, Benjamin Bloom, Marion Brady, Sir Alec Clegg, Albert Cullum, John Dewey,Paolo Friere, John Goodlad, Bruce Hammonds, John Holt, Alfie Kohn, Maria Montessori, Jean Piaget, Postman & Weingartner, Diane Ravitch, Sir Ken Robinson, Kelvin Smythe…and thousands of other commentators who understand how children learn in classroom settings; and are prepared to profess it. Their views are readily available as a google consultation. They are the true-blue heroes of children; there is no doubt. 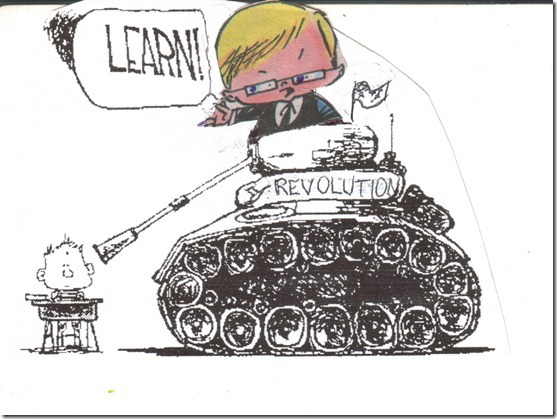 The schooling world is changing and its sad future can be easily predicted. Mega-bucks rule. 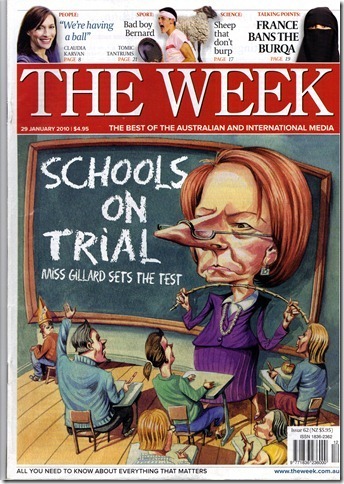 It would be really naive to think that the Murdoch-Klein combination, now spending billions on test preparation and digital instruction will not take over Australian schooling completely. Our schooling system now operates on the Klein philosophy as he and Julia G. publically confirm. It’s preparation time for almost 100% Murdoch-Klein tech-ed. Compliant suckers, victims of political bullying, have acquiesced and will follow them. One can confidently expect that our classrooms will feature less human interaction and more computer interaction. Teacher training will not be required, except the study of how to select and direct digitised programs. Rupert and Joel, however, will do most of this for them. Digitogy will replace pedagogy. Tests will be run more regularly, with direct connection to the Big Brothers of the world based in city offices. There will be little need for teachers to possess a range of different teaching-learning techniques nor a repertoire of shared evaluation devices. Teacher training [for school authorities that subscribe to fear-based schooling] will not be necessary. Teaching-learning-based Principals are being made redundant in the UK http://www.bbc.co.uk/news/education-16050321 as of now. No need for the development of a wide range of teaching strategies as we have known them. Measurement Darleks will control the mechanics of the new order. At the same time school authorities, such as Finland, that respect teaching expertise and share the pride in pupil achievement, have extended teacher preparation time [4-year Masters Degree] to include personal adjustment to the use of all teaching strategies from Maieutic to Didactic. Such authorities believe that children achieve better as they enjoy duress-free learning throughout the school year under the pupilling of well-trained teachers; the opposite of Klein-based scare-ridden mid-year annual blanket testing. Finland and other advanced, thoughtful countries have proved that it works better. Australia ignores any dialogue about such a system and its near alternatives, even though open discussion is critical. It is forbidden. We seem to be stuck with Klein-based schooling. We don’t seem to want to share achievements with parents and pupils at the point of learning. As one Primary Principal asks on his school-site : “Where are we heading and what have we lost to get there?’ There is little doubt that individual Principals need to state their feelings, principles and beliefs to their clients – the parents and their children – clearly and forthrightly. The vehicle for doing this is their school’s website. Their views need to be stated in large font and with passion if they believe in the dignity of their pupils. If they care little about their pupils, they will follow the child- lynching mob and use instruments of child torture such as high stakes blanket testing. Paul Thomson of the highly regarded learning-charged Kimberley College http://kimberley.org says it with clear conviction. The measurement buffs miss out on this and wouldn’t do what they do if they had been in a classroom for any length of time. Those who have, and support NAPLAN, are ignoring the good things that they did.. I taught him almost fifty years ago. He remembered me and sent this. It’s a great day today. These things don’t happen often. To all those who have taught, or are still teaching,  this one’s for you. Loved the last line. “I make kids sit through 40 minutes of class time when their parents can’t make them sit for 5 without an iPod, Game Cube or movie rental. “I teach them to write and then I make them write. “I make them show all their work in math. They use their given brain, not the man-made calculator. “Then, when people try to judge me by what I make, with me knowing money isn’t everything, I can hold my head up high and pay no attention because they are ignorant. Even all your personal teachers like mothers, fathers, brothers, sisters, coaches and your spiritual leaders/teachers. A truly profound answer!!! Teaching is THE profession that makes all other professions possible! The Treehorn Express is dedicated to the cessation of Kleinist NAPLAN testing in Australia. Kleinism is a New York version of fear-driven schooling which uses the blanket-testing NAPLAN to destroy the reputation of teachers and schools. This weapon was forced on schools in Australia in 2009. It separates ‘haves’ from ‘have nots’ and opens the door for mega-bank-rolling by known curriculum vandals for control of school-based learning. It pays well. It disrespects all school pupils [especially public school pupils], devalues teachers’ professionalism, threatens Australia’s developmental future and is just no good. Politely described, it stinks. Although some ‘pro-Julia education’ groups support it, ideologically, NAPLAN is immoral, unprofessional, politically driven, unrequested by the profession, curriculum destructive, extremely costly, wasteful and divisive. There has never been a time in the history of schooling that so many absurdities have occurred. Schooling, in the USA, Britain, Australia and New Zealand, has become a pure-and-simple test driven operation for an large important part of each school year. The face of teaching has changed to test preparation because big business wants it to be. ‘Testing’ dominates school time and pushes creative aspects of the school curriculum out of the way. Amongst the biggest of businesses is test publishing. It’s raison d’etre is greed; certainly not school improvement. The wonderful work that primary schools in Australia do now, despite these enormous unwanted and useless test-based intrusions into their administration and their teaching time, is testimony to the potential greatness of this country, that will be realized when its schools are allowed to operate in a professional manner. Go and visit one and you will see. They do exceptional work to overcome the politically charged assaults. It borders on amazing. It’s quite absurd that this state of affairs has to continue…that teachers are stretching themselves to help children develop their full potential in the face of plainly stupid, political fear-based absurdities that interfere with their efforts. A profit-making connection of Australian test publishing companies with the Murdoch-Klein testing empire has yet to be made public. There may not be one as yet, but it would be naive to accept that there won’t be a connection….soon. In the interest of absurdity, Australia will do what the emperor wants….unless we adults say something about it. A case study and its implications has presented itself in Queensland within the last few weeks. A State School included ‘Excel NAPLAN practice test books’ on its book list for 2012 for parents to purchase. Some parents objected. 1. Are arrangements made for the children of such parents to learn mathematics in a different style or enhance their literacy accomplishments – and not practice tests. If so, who teaches them? 2. If sufficient parents at a large school opt-out [i.e. indicate to the school that they don’t want their children to do the NAPLAN tests], will classes be arranged as NAPLAN and non-NAPLAN classes? 4. Will there be NAPLAN and non-NAPLAN state schools in the future? A start has been made. A recommended wet-day pursuit or any-day pursuit is to search through school websites [NO – not ‘My-school’; that’s a waste] and ask yourself if you would send your child to each school, based on the information provided. I did it for an afternoon recently. I visited six in Queensland. I certainly would not enrol my child at two of them. One emphasised its concentration on scoring better on NAPLAN tests [‘As with all Q’ld schools our Years 3,5,7 will all sit the NAPLAN tests; so strong preparation for this part of the year is central to our curriculum’], the other hinted it. I looked for those that believed in the teacher-child connection and, so, used the word ‘pupil’. None. All use the government sponsored trite non-school term. …’student’. I looked for those who told parents, clearly, that they could withdraw their children from NAPLAN testing, simply by informing the Principal. None. I looked for Principals who gave their studied, professional opinion on blanket testing since it now dominates the curriculum landscape. None. I looked for views-on and methods-of shared evaluation. None. Most statements about beliefs in schooling were first rate. One was quite outstanding, citing authoritative sources for its beliefs and was quite persuasive about its class arrangements [Yes. Multi-aged]. Disappointingly, it did not give its view of NAPLAN testing. It seemed as if it wanted to say something, but wasn’t game. APPA [Australians Primary Principals Association] stated to the ‘Senate Inquiry into NAPLAN’ [ Google: senate inquiry naplan : Click : submissions received ; Click : 228 ] in Para 3 “APPA supports the use of NAPLAN”. Then, three paragraphs further on, lists six very strong, cogent, professionally-based reasons why NAPLAN should not be entertained at all; followed by seven negative consequences of public reporting. I mean to say ????? !!!! Gold medal absurdity or Orwellian double-speak ? Stalinism “The similarities between what is being proposed in countries pursuing a national standards agenda and 1930 Russia has been noted by American critics of national testing.” And we imported the Klein-system of fear-based schooling to Australia from America! Ye Gods! Talk about absurdity. ‘Learn from what not to do from reform in the US’ said Joe Bower from Alberta, Canada quoting from “Testing, Testing’ by Larry Bool and J.C.Couture. They maintain that the absurd elements of the absurd US reform are largely ideological…. For Australia [as well as Canada] to copy such reform elements beggars belief. Testing programs in schools throughout the world, in this unfortunate age, are grossly absurd. This is starting to work in Australia . Unpersons comply and the rest of us encourage them by our silence. It IS a sad, absurd age.